This is a simple Haas panner, it uses psycho-acoustics to make you believe the audio comes from either left or right (depending which way you pan… duh) but in reality the audio haven’t moved a single bit. At least not in the stereo image, check your stereo level meter and you’ll find the energy is still exactly the same on both Left and Right channel. 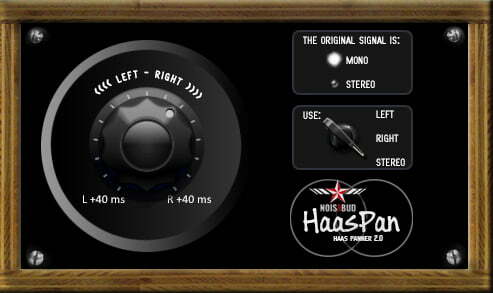 Haas panning is a great way to add stereo field and depth to your mixes. “The Haas effect is a psychoacoustic effect related to a group of auditory phenomena known as the Precedence Effect or law of the first wave front. These effects, in conjunction with sensory reaction(s) to other physical differences (such as phase differences) between perceived sounds, are responsible for the ability of listeners with two ears to accurately localize sounds coming from around them. When two identical sounds (i.e., identical sound waves of the same perceived intensity) originate from two sources at different distances from the listener, the sound created at the closest location is heard (arrives) first. To the listener, this creates the impression that the sound comes from that location alone due to a phenomenon that might be described as “involuntary sensory inhibition” in that one’s perception of later arrivals is suppressed.